3: Select a creature in play; that creature is considered out of play as long as Coffin remains tapped. Hence the creature cannot be the target of spells and cannot receive damage, use special powers, attack, or defend. All counters and enchantments on the creature remain but are also out of play. 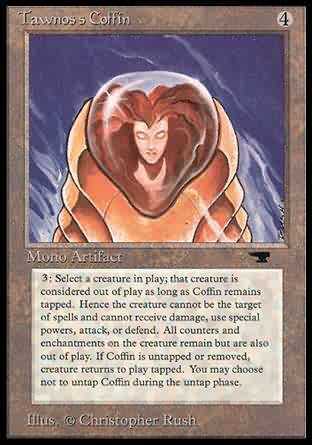 If Coffin is untapped or removed, creature returns to play tapped. You may choose not to untap Coffin during the untap phase. 3, T Target creature phases out. It can't phase in as long as Tawnos's Coffin remains tapped. When Tawnos's Coffin leaves play or becomes untapped, the creature phases in tapped.